Wolfram Vollmer founded his company in 1946. In a rented room in Stuttgart, Germany, 10 employees produced steel collar and linen buttons, tie pins and other sundries. Two years later, the demand for his haberdashery products collapsed, and so Vollmer went to BASF for a few weeks to learn how to run an injection molding machine. Steel buttons then became plastic ones, and the demand returned. After building some model trains for his sons, Vollmer was inspired to manufacture model railroad accessories, and he brought a new overhead wire system to the 1949 Nürnberg International Toy Fair. Demand was overwhelming, so he followed with bridges, buildings and other accessories. 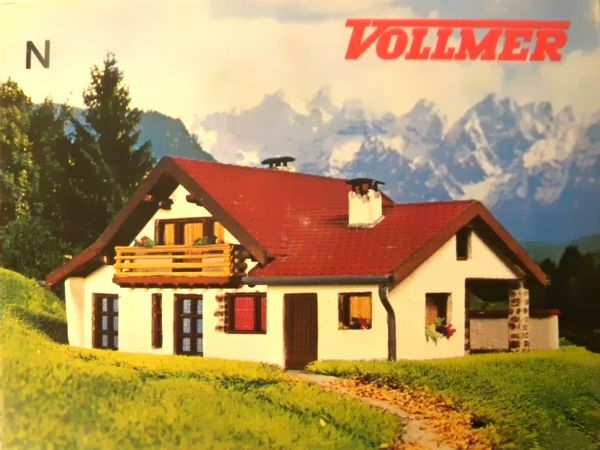 Groundbreaking for Vollmer's new factory in Zuffenhausen took place in 1956, with expansions in 1963, 1973 and 1979. After considerable success and a peak in 2008 of over 1,000 products, 2013 saw declining sales, and Vollmer closed the business. In 2014, Viessmann bought the rights to all of Vollmer's tooling (as well as Kibri's), so the line continues today. Vollmer entered the N Scale market in 1965 with some possibly "dual-scale" N/TT kits, but by 1967 had a healthy line of N Scale building and bridge kits, plus catenary. Vollmer got visibility in the US early on thanks to Boyd Models.